Imagine you’re overseas on a business trip and you suffer a serious ankle sprain. You’re not fluent in the language, you’re unfamiliar with the country’s healthcare system, and you can barely hobble your way back to your hotel. What do you do? 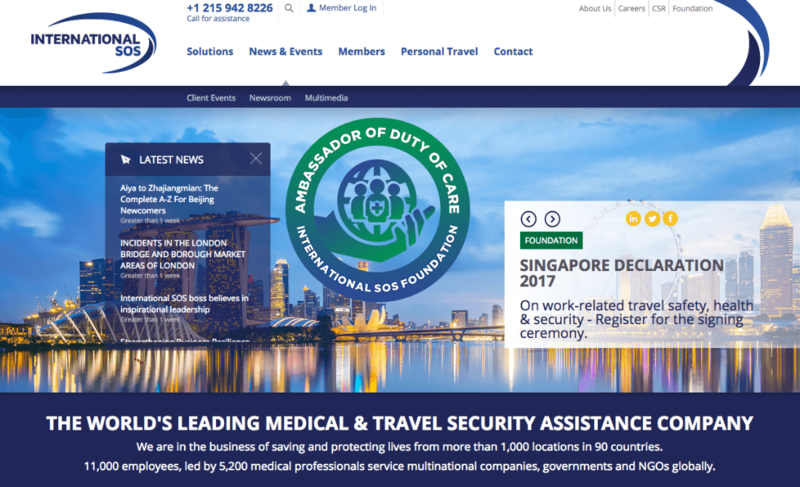 If your employer uses the services of International SOS, a leading medical and travel security assistance company, the answer is just a phone call away. “Whether you’re a very seasoned traveler or a novice, you never know what might happen,” said Miriam Jones, the company’s vice president of sales for West Coast USA. She recently spoke with RewardExpert about International SOS’s history and services as well as the benefits they provide companies and other organizations. International SOS was founded in Singapore in 1985 by two childhood friends, Arnaud Vaissié and Dr. Pascal Rey-Herme. Rey-Herme and Vaissié began providing evacuation support, arranging transportation to and from Singapore for those who needed medical attention. Simply put, International SOS’s mission is to help their clients—namely companies and other organizations—care for employees no matter where their business travels take them. One of the ways in which they do this is by offering 24/7 assistance in nearly 100 languages. The company works with more than 77,000 medical and security providers across the globe and accredits the hospitals and clinics in its network to ensure travelers are receiving the best care possible. She said the company’s model is “call early and call often,” as doing so can prevent an inconvenience from becoming a serious emergency and a costly insurance claim. In addition to 24/7 assistance, International SOS provides employers with comprehensive preventative programs that include risk assessment, training, and the development of policies and procedures. As the perception of risk has increased due to events such as terrorism attacks, natural disasters and viral epidemics, so has the number of employers choosing to use International SOS no matter where they send their employees on business.